Proper tire pressure can improve fuel economy, handling, safety, and increase the lifespan of your tires and vehicle. Maintaining your tire pressures is cheap and doesn’t take much time. At Mel Rapton Honda our experts are here to explain the importance of tire pressure, and how simple it is to keep up with. Your fuel mileage is affected most when your tire pressure is too low. Tires that are not properly inflated take more effort and more fuel to get moving. It also requires more skill to keep those tires moving, as there is more resistance from the road. You can lose a significant amount of fuel mileage by going too long between tire checkups. Common car and small truck tires are designed to sit flat on the road using the entire surface area of the tread. If they are underinflated, the outer edges of the tread will wear down faster. If they are over-inflated, the tread wears down faster in the middle. These areas are prone to damage, punctures, and blowouts. You will also use up tires faster when the wear is concentrated to certain areas. This means you will be forced to replace your tires more often, and spend more money over the lifetime of the vehicle. The importance of tire pressure goes far beyond tire health and longevity. Tire pressure also ensures that your braking and steering systems are responsive and can work like they were designed to. Tires that are over-inflated tend to be harder to stop. Tires that are underinflated tend to be harder to turn and handle. Proper tire inflation is the first step to a comfortable ride. If your tire pressure is too high, the rubber will have no play. An overly stiff tire means that you feel each and every bump in the road. Over-inflated tires also increase road noise making highway travel louder and more straining. How Often Do I Check my Tires? Anyone who does not have a tire pressure monitoring system must check your tire pressure the old-fashioned way, with a gauge. You will want to do this every month, or at least every other month. Tires naturally lose pressure over time, and they will need to be replenished regularly as part of your normal vehicle upkeep. 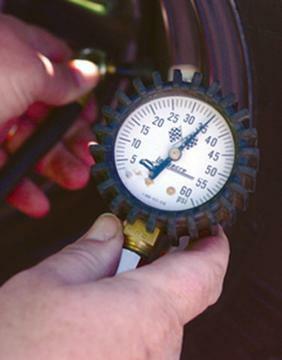 A local tire shop is equipped with tire pressure gauges and compressors, and they can quickly adjust your tire pressure for a very low cost or no cost at all. Many new vehicles are equipped with tire pressure monitoring systems. This makes keeping an eye on your tire pressures easier than ever. However, that still means that you must verify the tire pressures and keep them inflated. On average, you lose 1-3 PSI per month just by natural loss. This means monthly or bimonthly air-ups are normal. For more help, contact Mel Rapton Honda for car service and scheduling.